A new exhibition opened at Down County Museum on Thursday 10 October featuring a selection of photographs of South Down. ‘Two Men of Mourne’, displays some of the most interesting and striking images taken by Pat Hudson in the 1940’s and Cecil Newman in the 1960’s. Patrick John Hudson was born on the 7 August 1920 in Newry, Co Down. 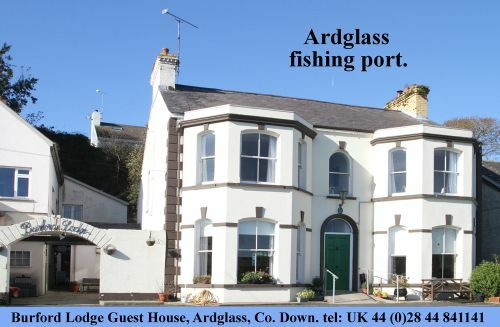 In 1925, the family moved to nearby Kilkeel, where his father opened his own business. At an early age, with the help of his father and a box Brownie camera, Pat began a lifelong love affair with photography and nature study. He constructed a makeshift ‘hide’, from which he was able to photograph birds in the garden. In 1949 he went to work in an East African pharmacy combined with photographic department. Here the climate, animals and scenery, provided inspiration for many photographs. He eventually settled in New Zealand. His family lent many of his photographs to the Museum for copying and the photographs which feature in this exhibition and publication were taken of the Mournes and South Down in the 1940’s. While Pat was taking these photographs purely for his own interest, fortunately for us he has recorded a world on the brink of great social change. Cecil Newman was born in Lisburn in 1914, the son of a RIC policeman whose family had come from a farming background in West Cork. He grew up in Sydenham, Belfast; as a young man he enjoyed hiking and youth hostelling and was an active member of the 10th Belfast Scout group. In 1931 while on a scout visit to Austria and Germany he began photographing the landscape and people. He joined the army during World War II and after the war returned to his job with the surveyors’ department at Belfast City Council. His work as a Planning Officer contributed to the overall strategy of the Mourne and Newry Area Plans. He had many opportunities to use his photographic skills in this work. During the 1970s Cecil concentrated particularly on aerial photography. This was a great asset to him in professional terms as a means of assessing and recording the development of landscape and townscape. His interest in the rapidly changing urban and rural landscape is evident from the photographs now in the Down County Museum and National Museums Northern Ireland collections. Those selected to illustrate this book represent his wide-ranging interests in the Mournes, from archaeological sites to modern buildings, and rubbish dumps to mountain climbing. The exhibition of these two photographers’ work is currently on display at the Down County Museum. ‘Two Men of Mourne’, this year’s edition of the Museum’s yearbook, the Down Survey, featuring their work will also be launched. The photographic archive in Down County Museum is an especially important part of the collection and the museum has already published two volumes of photographs in the Down Survey series, representing the work of D J McNeill and Thomas Gribben. This latest volume is but a further stage in making the archive more accessible. The new publication is available to purchase from the Museum and is priced at £8.